What is a Tunnel to Towers 5K Run & Walk?The Tunnel to Towers 5K Run & Walk Series was created to honor the heroic life and death of Stephen Siller, a New York City firefighter (FDNY) who lost his life on September 11, 2001 after strapping on his gear and running through the Brooklyn Battery Tunnel to the Twin Towers.Honor all of those who lost their lives on September 11, 2001 and support our first responders and military who make extraordinary sacrifices in the line of duty! For more information on the Stephen Siller Tunnel to Towers Foundation, please visit www.tunnel2towers.org This is the 4 th Annual Clearwater Tunnel to Towers 5K Run & Walk. 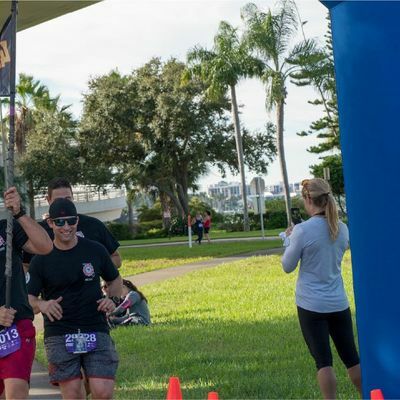 It is an inspiring event taking place at Coachman Park while the course has you running in awe along the Memorial Causeway route. 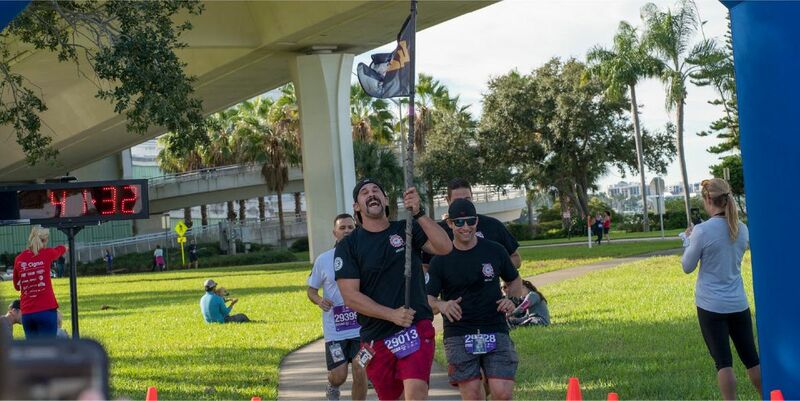 Be inspired as you finish this event along side our First-responders running if full gear!How far is a Tunnel to Towers 5K Run & Walk?This is a 5K (3.1 miles). You are welcome to walk or run this event.Where can I pick up my packet?TBD.Can I register the day of the run?Yes. Registration will open at 6:30 a.m. on the day of the race at Coachman Park, check only. No cash. T shirts are not guaranteed day of registrationWhen does online registration close?Online registration will close on November 1st at 12 noon. What about youth registration under the age of 18?Youth constitutes ages 13-17, with a less expensive registration fee of $30. A child constitutes ages 12 and under, which are free without a race packet. A race packet consisting of a Bib # and event shirt has a registration fee of $20. Be sure to register by October 12th to guarantee youth and adult T-shirt sizes. Is there transportation to and from the event?No, we do not provide transportation to and from the event.Is there parking available?Yes, at Coachman Park.I am a fast runner. Can I get a front line position?Runners predicting a pace faster than 6 minute/mile will be seeded in the front corral (arrive early).Will water be available?Yes, a water station will be available along the route at the midway point and finish line.What can you bring to the event? Can I run with a stroller, backpack, wheelchair, roller blades, bicycle, etc?Strollers and wheelchairs are permitted. Firefighter turnout gear and military backpacks are also permitted. Please leave all personal items and valuables in your vehicle. All items should be stored securely at the owner's risk. The Tunnel to Towers Foundation will not be responsible for the loss of any items.If I have a backpack, what do I do with it? Please leave all personal items and valuables in your vehicle. All items should be stored securely at the owner's risk. The Tunnel to Towers Foundation will not be responsible for the loss of any items.Does my registration fee count towards my fundraising goal? Your registration fee does not count toward the fundraising goal on Crowdrise.Can someone else pick up my packet for me?Yes, they can. They must present a copy of your registration receipt. And don't forget to thank them!Can I still donate to a team and/or individual after the start of the race?Yes. Donations will be accepted for 6 weeks after the event. How can my company/organization sponsor this event?Please send all sponsorship correspondence to Y2xlYXJ3YXRlciB8IHR1bm5lbDJ0b3dlcnMgISBvcmc= with your contact information and someone will be in touch with you within 24 hours.I would like to donate goods or services to this event. How do I do that?You can contact us at Y2xlYXJ3YXRlciB8IHR1bm5lbDJ0b3dlcnMgISBvcmc=. We make every effort to keep costs down to allow us to give the most to the Tunnel to Towers Foundation in Stephen Siller's name. Your generosity will be greatly appreciated.As a participant, can I fundraise/encourage others to donate? Yes! Once you are registered, you will be given directions to start your own fundraising page and you will be able to accept donations online. Do you want to donate cash/money? We can help you with that. Contact us at Y2xlYXJ3YXRlciB8IHR1bm5lbDJ0b3dlcnMgISBvcmc= and we can walk you through the process or you can send donations directly to 2361 Hylan Boulevard., Staten Island, NY 10306 - please give us your information so we can add it to your fundraising page. It's easy!Can I get a refund? Can I transfer my registration?Unfortunately, ALL SALES ARE FINAL and we do not allow refunds. However, you may transfer yourregistration to another participant. For instructions on how to transfer your registration please, click here.How can I volunteer?It's simple! Click on the volunteer option above and enter your information to sign up. Thank you!